I'm begging to be curious about that rhubard! I never seen it to sell. This cake looks yummy, but I don't know the rhubard flavor. Gosh, does this look good! Oh boy, thanks for the recipe! This is one I'll definitely try. wow, this has unique ideas to me .. the marshmallows in the base .. my rhubarb is nearly done. . .I wonder if I could find a few more stalks out there. am i missing how much milk? thanks! i fixed it......thanks for pointing out that error, the amount for milk is there now. Oh... those ingredients have me curious... who would have thought-- rhubarb and marshmallows?? Oh Charlotte, you have posted yet another winner. You always have an interesting twist to your recipes. This does indeed look good. Maybe a good one to bring in to work on Monday.....thanks. How cool is that? My daughter just posted this recipe on her blog last week. It's obviously a good recipe to make its appearance on more than one blog. She posted a picture of the empty dish which proved its popularity with her family. Do you mix the first three things before spreading in or do you layer them? This looks so yummy and I can't wait to make it. 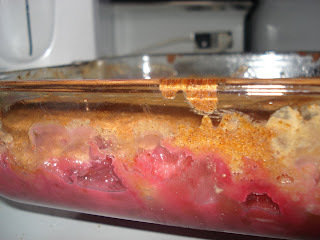 Just curious - did you use the strawberry jello or just plain sugar for the cake in the picture? Just found your blog through Chocolate and Marmalade Rea, and certainly glad I did: this looks so good! 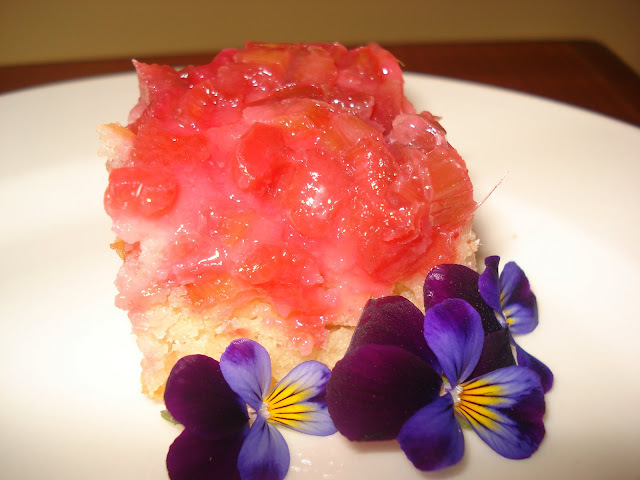 Am on a rhubarb kick, so must try!